The 2018 US Foods Week officially ended, after 10 days of gastronomic promotion, on Wednesday (Dec. 12). The chargé d’affaires at the US Embassy in Phnom Penh, Michael A. Newbill, spoke at the closing ceremony in Raffles Hotel Le Royal on Friday (Dec.14). Present at the auspicious ceremony were, among others, the economic associate at the US Embassy, Lauren Higgins, and Cambodian Tourism Federation President Luu Meng. Mr Newbill called the event a grand success, as it won over a great number of people who had sampled the high quality US foods offered, and a manifestation of the growing trade ties between the US and Cambodia. During the Foods Week’s two weekends several competitions were held, which were judged by a panel of personages, including US Department of Agriculture Senior Attaché for Agricultural Affairs Gerald Smith. Mr Newbill announced the winners of the contest for Most Creative Use of US-grown food items, and of the Young Chef Competition at the closing ceremony. Of the 16 competing restaurants, KWest Restaurant successfully bagged two awards – for the most creative use of California raisins and of US dried beans in their promotional menu items. Yisang Riverside Restaurant, Blue Sky Restaurant, and Topaz Restaurant each won an award for the most creative use of US-grown beef, potatoes and dried peas respectively. Other competitors were: Uy Kuyteav, Yi Sang Sothearos, World Dining, Kan Ji, Sevensea, New York Steakhouse, Ocean Prime Steakhouse, SALT N’ PEPPER, TERRAZZA, Hub Street Cocktails, Botanico Wine and Beer Garden, and The Exchange Restaurant. 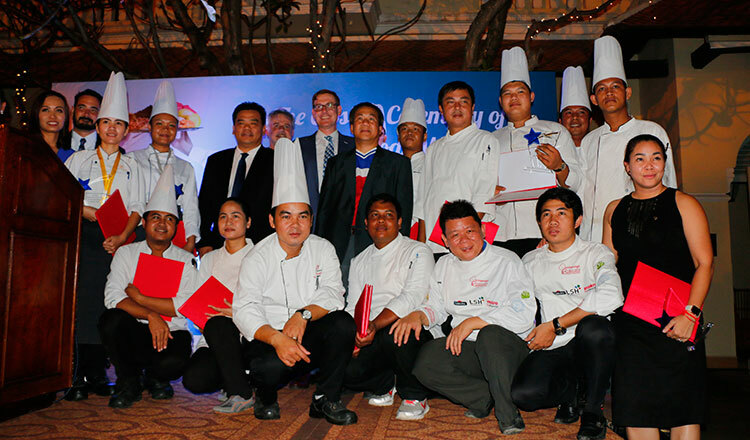 The Young Chef Competition took place at the Academy of Culinary Arts Cambodia on December 4. Eight young cooks championed their culinary creativity with US-grown prime beef chuck eye roll, dried chickpeas, dried pinto beans, hash browns (potatoes) and California black seedless raisins. The judges awarded first place to Lay Sreyroth (23, from Nagaworld Hotel & Casino), second place to Ou Rachana (23, from Nagaworld Hotel & Casino) and third place to Kon Vanna (22, from Khéma La Poste). 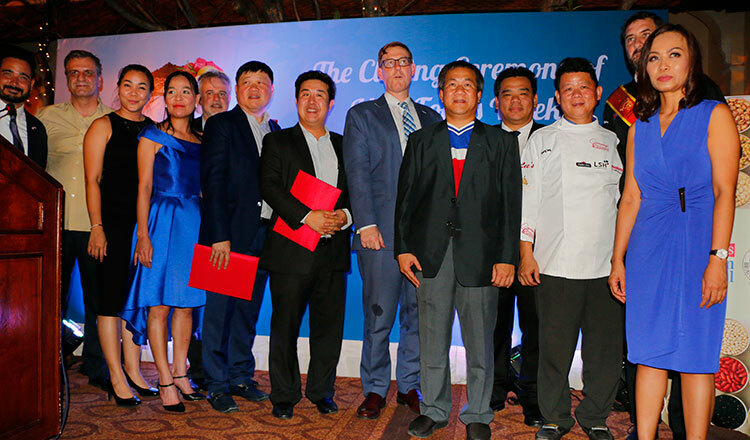 Five US industry groups, the US Dry Bean Council, Potatoes USA, the US Meat Export Federation, the USA Dry Pea and Lentil Council, and California Raisins, presented special awards to five of the contestants – Lay Sreyroth, Chea Vannak, Kon Vanna, Ou Rachana and Chhoeun Kim Hong. Ministry of Tourism Secretariat General Vath Chamroeun, spoke on behalf of Minister Dr. Thong Khon to commend the participants for their creativity in concocting one-of-a-kind dishes with food items from the States. “We are proud to recognise the achievements of this programme. It not only promotes US-grown products but also recognises outstanding Cambodian chefs, restaurants, and young talents that contributed to its overall success,” he said. The six major importers taking part in this year’s celebration, namely: LSH Cambodia Pte. 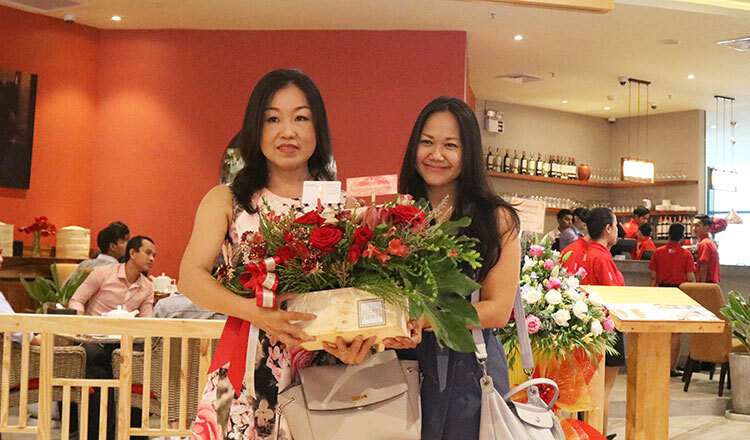 Ltd., Aus Khmer Import Export Co. Ltd., Thai Huot Trading Co. Ltd., Lee’s Foodservice Ltd., Hung Hiep (Cambodia) Co. Ltd., and Les Celliers d’Asie, were presented with certificates of appreciation.